The main parts of this book consist of three long articles that have previously been published by the Galilean Electrodynamics journal during three succeeding years as special summer issues. The subject is a new theory of ether that has been developed. This version of ether is compatible with special relativity theory (SRT), and thus it cannot be considered as an absolute frame of reference. One of the virtues of this book is that many of the novel predictions can be tested in high-tech laboratories; moreover, the book includes some new and extraordinary physical concepts that make the proposed claims rational and plausible. The words on the front page, “From the effect of pressure on time dilation to the unified mass-charge equation,” are not intended as a gossipy slogan, the likes of which sometimes appear in pseudoscientific media or science-fiction books; it is a true motto with a deep and physical basis. It is up to the reader, however, to judge whether or not the book really does what it sets out to do. Unfortunately, most of the recent theories in physics, with no clear deployment against the main tenets of relativity or quantum mechanics, are inflated in a way to be comprehensively explanatory, whereas there are few or no experimental evidences that support these theories as good descriptions of nature. In the author’s view, such theories baffle the minds of unsophisticated readers by deceptively pretending that a high level of knowledge is needed for the theories to be correctly understood and by confining seekers of knowledge to cages of complicated math forms. Such theories also deteriorate traditional science methodology over the course of time. Nonetheless, density theory (DT) tries to abide by the methodology of the renowned physics giants by founding profound postulates. The first chapter introduces a substantial number of Einstein’s general relativity predictions, which are recalculated according to density theory (DT) to validate the theory for the reader. The second chapter uses interesting concepts, some of which present empirically bizarre results and are undisclosed as of yet; e.g., it is shown that static pressure can dilate time and increase mass; the light beam is affected in specific magnetic and electrical fields, and thus we can deduce that photons are not always electrically neutral; ether negative mass causes universal expansion, and; water can behave as a biological ether especially for deep sea creatures, as its hydrostatic pressure can affect biological longevity. 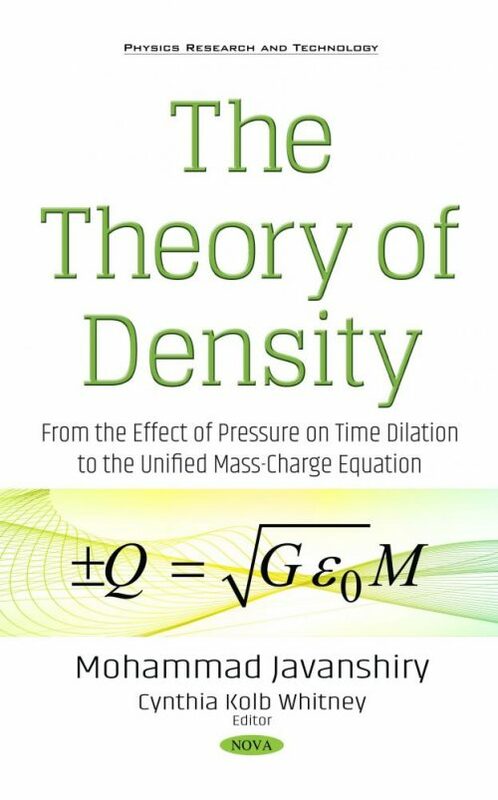 In chapter three, the author tries to unify mass and electrical charge – one of the oldest and most disputatious physical problems – in the single equation of “mass + rotation = charge” for the very first time in the history of science. Additionally, an alternative to the dynamo theory is brought forth. 2.6 Biological Ether: Do Deep Sea Creatures Live Longer? B. DT's Refractive Index in the Uniform Acceleration and a Possibility for Violating EEP! G. Cone's Axis Does Not Pass Through the Foci of Any of Its Ellipses! [.1.] J.R. Taylor, C.D. Zafiratos, M.A. Dubson, Modern Physics, Chap. 2, Sec. 10, p. 72 (Prentice Hall, New Jersey, 2004). [ 2 ]	M. Sachs, “On the Logical Status of Equivalence Principles in General Relativity Theory” The British Journal for the Philosophy of Science 27, 225-229 (1976). [.3.] A. Einstein, “How I Created the Theory of Relativity” Physics Today 45 (1982). [.4.] A. Einstein, Relativity: The Special and General Theory, Chap. 23, p. 70 (Methuen & Co. Ltd., 1916). [.5.] W. Rindler, Essential Relativity: Special, General, and Cosmological, Chap. 1, Sec. 13, p. 19 (Oxford University Press, New York, 2006). [.6.] A Einstein, “Grundgedanken und Probleme der Relativitätstheorie”, ["Basic Thoughts and Problems of the Theory of Relativity"] Nobelstiftelsen, Les Prix Nobel en 1921-1922 (Imprimerie Royale, Stockholm, 1923). [.7.] G.F.R. Ellis, R. M. Williams, Flat and Curved Space Times, Chap. 5, Sec. 4 (Clarendon Press, Oxford, 1988). [.8.] D.G. Stoinov, D. Stoynov, “Is the speed of light in vacuum constant?” The General Science Journal (2004). [ 9 ]	C. Stoica, “Analytic Reissner-Nordström singularity” arXiv:1111.4332 [gr-qc] (2012). M. Born, Einstein’s Theory of Relativity, Chap. 5, Sec. 1, p. 130 (E.P. Dutton and Company Publishers, New York, 1922). “Inverse-square law” Wikipedia, https://en.wikipedia.org/wiki/ Inverse-square_law. P.A. Tipler, Physics, Vol 2, Chap. 35, Sec. 8, p. 951 (CBS Publishers & Distributors, India, 2004). B. Basu, An Introduction to Astrophysics, Chap. 1, Sec. 1, p. 2 (Prentice-Hall of India, New Delhi, 2004). F.P. Beer, E. R. Johnston, Vector Mechanics for Engineers, Statics and Dynamics, Vol. 2, Chap. 11, Sec. 13, p. 662 (Mc Graw-Hill, New York, 1997). A. Schwartz, Calculus and Analytic Geometry, Chap. 14, Sec. 8, p. 899 (Holt, Rinehart and Winston, Inc., New York, 1967). S. Weinberg, Gravitation and Cosmology, Chap. 8, Sec. 5, p. 190 (John Wiley and Sons, New York, 1972). R. Resnick, Introduction to Special Relativity, p. 212 (John Wiley and Sons, New York, 1968). A. Einstein, “E = mc2: The most urgent problem of our time” Science Illustrated (1), 16-17 (1946). L. D. Landau, E. M. Lifshitz, Fluid Mechanics, Chap. 1, Sec. 3, p. 8 (Pergamon Press Ltd., Oxford,1966). R.A. Serway, C. J. Moses, C. A. Moyer, Modern Physics, Chap. 2, p. 63 (Thomson Learning, California, 2005). B. Altschul, “Astrophysical Bounds on the Photon Charge and Magnetic Moment” arXiv:0711.2038 [hep-th] (2007). E. F. Taylor, J. A. Wheeler, Exploring Black Holes, Chap. 3, Prob. 3 (Addison Wesley, Massachusetts, 2000). C.M. Will, “The Confrontation between General Relativity and Experiment” Living Rev. Relativity 17, 10 (2014) http://www.livingreviews.org/lrr-2014-4. F. G. Klärner, F. Wurche, “The Effect of Pressure on Organic Reactions” Journal für praktische Chemie 342, (7) 609 (2000). D. A. Wharton, Life at the Limits, Chap. 6, p. 199 (Cambridge University Press, Cambridge, 2002). G. M. Cailliet et al., “Age determination and validation studies of marine fishes: do deep-dwellers live longer?” Experimental Gerontology 36, 739-764 (2001). J. Larmor, “Possible rotational origin of magnetic fields of sun and earth” Electrical Review 85, p. 412ff (1919). E.V.P. Smith, K.C. Jacobs, M. Zeilik, Introductory Astronomy and Astrophysics, (Saunders College Publishing/Harcourt Brace, USA, 1987). “Sun fact sheet” NASA files, http://nssdc.gsfc.nasa.gov/ planetary/factsheet/sunfact.html. “Mercury fact sheet” NASA files, http://nssdc.gsfc.nasa.gov/ planetary/factsheet/mercuryfact.html. “Why does not Venus have a magnetic field?” NASA files, http://image.gsfc.nasa.gov/poetry/venus/V3.html. “Earth fact sheet” NASA files, http://nssdc.gsfc.nasa.gov/ planetary/factsheet/earthfact.html. “Moon Anomalies” NASA files, http://www.nasa.gov/pdf/ 180577main_ETM.Moon.Anomalies.pdf. “Mars Crustal Magnetism” NASA files, p. 4, http://mgs-mager.gsfc.nasa.gov/publications/ssr_111_connerney/ssr_111_connerney.pdf. “Jupiter fact sheet” NASA files, http://nssdc.gsfc.nasa.gov/ planetary/factsheet/jupiterfact.html. “Saturn fact sheet” NASA files, http://nssdc.gsfc.nasa.gov/ planetary/factsheet/saturnfact.html. “Uranus fact sheet” NASA files, http://nssdc.gsfc.nasa.gov/ planetary/factsheet/uranusfact.html. “Neptune fact sheet” NASA files, http://nssdc.gsfc.nasa.gov/ planetary/factsheet/neptunefact.html. A. Reisenegger, “Origin and Evolution of Neutron Star Magnetic Fields” International Workshop on Strong Magnetic Fields and Neutron Stars (ICIMAF), arXiv:astro-ph/0307133, p. 3. H. Dehmelt, “A Single Atomic Particle Forever Floating at Rest in Free Space: New Value for Electron Radius” Physica Scripta 22, 102-110 (1988). D. Hestenes, “Quantum Mechanics from Self-Interaction” Foundations of Physics 15 (1), 63-87 (1983). D. L. Bergman, J. P. Wesley, “Spinning Charged Ring Model of Electron Yielding Anomalous Magnetic Moment” Galilean Electrodynamics 1, 63-67 (1990). “Geomagnetic Reversal” Wikipedia, https://en.wikipedia.org/ wiki/Geomagnetic_reversal. W. R. Ward, “Tidal friction and generalized Cassini’s laws in the solar system”. The Astronomical Journal 80 (1), 64-70 (1975). F. Moulin, “Magnetic monopoles and Lorentz force” Nuovo Cimento B 116 (8), 869–877, arXiv:math-ph/0203043 (2001). M. A. Zeilik, S. A. Gregory, Introductory Astronomy and Astrophysics, pp. 321-322 (Cengage Learning, Massachusetts, 1998). X. Mei, “The Precise Inner Solutions of Gravity Field Equations of Hollow and Solid Spheres and the Theorem of Singularity” International Journal of Astronomy and Astrophysics, 1 (3), 109-116 (2011). “Milky Way”, Wikipedia, https://en.wikipedia.org/wiki/ Milky_Way. A. Einstein, The Meaning of Relativity, p. 106 (Princeton University Press, Princeton, 1923).